This article will explain a basic implementation of RadPivotGrid using LocalDataSourceProvider. Adding RadPivotGrid to your application. Drag RadPivotGrid from the Toolbox. 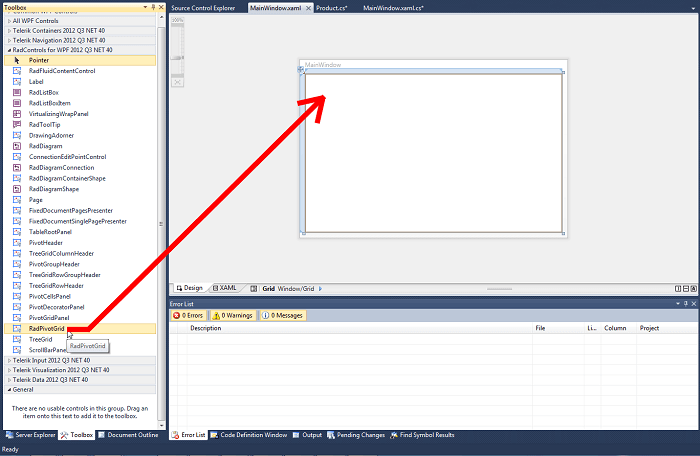 It can be found under UI for SilverLight but only if you have installed Telerik controls. You will have to define the pivot namespace in your XAML: xmlns:pivot="http://schemas.telerik.com/2008/xaml/presentation/pivot"
In our application we will show data for some office materials - their quantity, price through the year, etc. So our first task is to create a class that will present one product. It is time to define the DataSource for our RadPivotGrid. We'll do it in the resources in our XAML. The idea of the DataSourceProvider is to define which properties will be shown as a Columns, Rows and Aggregates. For our example we'll use Name as a Row, Date as a Column, Price and Quantity as Aggregates. In the definition of the RadPivotGrid you'll have to set the DataProvider property to the LocalDataSourceProvider we've just created.